As anyone who has fallen down the spinning 'rabbit-hole' has probably discovered, when one gets involved in a 'hobby' that others they know are passionate about, generosity often abounds and occasionally stuff just seems to show up on your doorstep. With spinning, it's usually some sort of delicious fiber, but with babies, it's often clothes and toys. Sometimes it's clothes for you (and really, god bless the gifted and/or hand-me-down maternity clothes. They're a life-saver. ), and sometimes it's stuff for the wee bairn. We have had the fantastic good fortune of having really amazing friends and family with lots of kid stuff and, usually, not a lot of storage space. So, when we announced that we were pregnant, many of our friends and family seemed to ecstatically come forth with a plethora of wonderful, wonderful things for us (Oh man, not to mention the FANTASTIC and unbelievably useful stream of tips and advice. Not kidding here, it's been utterly invaluable. ), and we have been, quite honestly, overwhelmed by this generosity. We will not discuss the misty-eyed gratitude and excitement, lest things get overly-sappy around here, nor will we discuss the amount of time that we have spent playing with Weebeastie's new toys ourselves, because that would just be unseemly. Or something. Instead, we will talk here today about the joy of rejuvenating or re-purposing kid's clothes. One of the things we've received is a ton of GREAT clothes, most in perfect condition - here's where that growing-too-fast-to-wear-out-the-clothes thing pays off for the next kid in line. This is also where the gender-neutral thing pays off for us, because I'm certain that I'm planning to put this little guy in stuff that his dad would never buy for him, if you know what i mean. Occasionally, however, we've received some perfectly useful, even lovely, clothes that maybe have a teensy bit of food staining, or maybe they're just too girly for me to be able to overcome dad's objections. Enter: a bottle of RIT dye, the dye pot, some fun fabric prints and some fusible web. One Saturday, while we were doing a whole bunch of other work on the house, I literally threw a handful of clothes into the dye pot with a bottle of Navy RIT dye, stirred for a bit (like...5 minutes, just to make sure everything was saturated) and then walked away for an hour or so. Now, mind you, I know that the bottle says to stir constantly, but I just wasn't going to do that, so ....you know....should you try this, I would never recommend that you do anything other than what's in the directions on the bottle, etc., etc., etc., blah, blah, blah. Anyway, I didn't have time (or inclination) to stir them, so I didn't. Please don't report me to the crafting/dyeing police. Aren't they the cutest? I would have been happy to stop there, and did for most items, but a few things had stuff on them that maybe needed disguising. 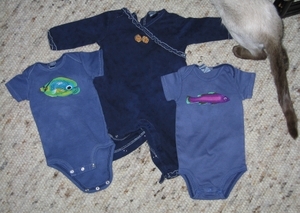 For instance, the onesie on the left has the phrase "Daddy's Little Princess" printed on it. Now, the father of the house is pretty liberal, it's true, but I was pretty sure he'd draw the line at that, so out came some stashed fish print fabric (from the clearance bin), the scissors, and the fusible web. LITERALLY less than 10 mins later, voila.....instant, machine-washable cuteness. Just wait 'til his onesies are big enough for the pin-up girls. Lookee! 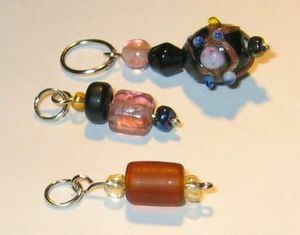 Handmade stitchmarkers! Aren't they the cutest? This is what I did last night instead of work on my socks or post in this here bloggy. 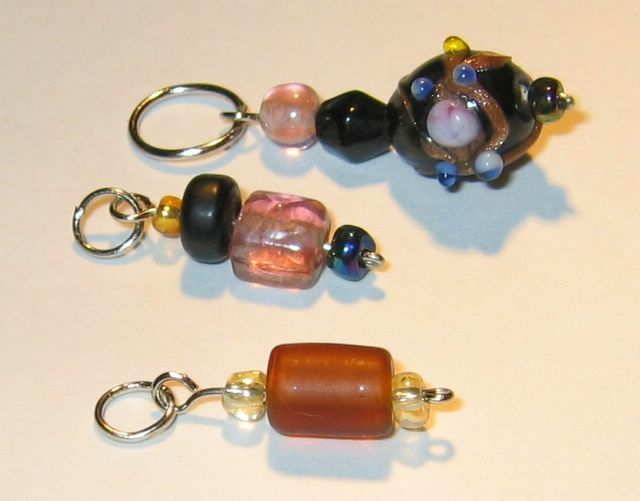 These little babies are seriously addictive and so remarkably easy, I can hardly stand it. It's enough to make a girl pick up a new obs....um, shhhh.....don't tell anyone I started to say that. I'm not allowed. 1. Total amount of music files on your computer: Once upon a time, there was a this very happy princess in a land of unending music. I don't know how much it was, but it was way , way more than my iPod could hold....from Ambient to Classical to Goth to Industrial to Klezmer to Zydeco -- my musical taste is all over the place. Then some sort of Karmic debt backlash occurred. We won't go into it here, but I lost everything in a dramatic and tragic hard drive seizure. Everything. Don't even THINK about asking whether I had a backup, mmmkay? So then this wonderfully generous friend (who will remain nameless to protect the not-so-innocent from RIAA prosecution) sent me a handful of DVD's containing HIS ENTIRE MUSIC COLLECTION. Does that rock or what? The fantastic news is that he has really great taste and I have 31 GB of fun new music, some I know and love, and some totally new to me. The bad news is that no matter how great it is, it's not MY music -- know what I mean? Someday soon (read: in the next two years - funny how one's perceptions of time change when renovating a house) I will get to unpack all of my CD's from our move this past summer and do all of that ripping work over again. I suspect that you'll be hearing all about it here, like it or not. 2. The last CD you bought was: Well, downloaded from iTunes, but it was Bjork - Medulla. Yes, it was months and months and months ago. It's a painful truth. See above re: renovations. I WAS trying to be very disciplined about not getting anything new until my desktop computer was unpacked and reconnected, which happened three weeks ago. Then there was a huge yarn sale at Webs, and then the new Peruvian highland Wool colors came out at Elann, and then, well, you get the picture. I REALLY want a floor in the bathroom we're building, so I haven't allowed myself to even LOOK at iTunes. It hurts. 3. What is the song you last listened to before reading this message? Ben Folds - Zak and Sara. It's the first song on a compilation created by the above-mentioned incredibly generous music angel. I've been trying to listen to it since I got it weeks ago, but it seems somehow jinxed in that invariably, I can sit here for HOURS w/o a single interruption, but let me pop this CD into my player and every single person in my office building will find themselves DESPERATELY in need of some nonsensical thing or another that only exists in MY office. I simply can't make it past the first 3 tracks. I'll keep trying, I swear. 4. Write down 5 songs you often listen to or that mean a lot to you. You have GOT to be kidding! JUST five?! Criminy....um......I'll try. Sarah McLachlan - anything off of Fumbling towards Ecstasy. I can still remember what it felt like when I discovered this album and this voice for the first time. You'd think after all these years it would no longer be in heavy rotation, but apparently I can't get enough of it. It's on the playlist every other week or so. I'm a sucker for haunting female vocals. Not necessarily ethereal (though I love that too) but specifically "haunting". However, in a nod to my Southern, beachgoing, semi-redneck heritage, I'll throw a shout out to old school Jimmy Buffett. I KNOW! It's an artist not a song, and it's not in any way cool, but his early stuff was SO much a part of the carefree early years of tree-climbing, body-surfing, loooooong lazy days of childhood that I can't ignore him just because he's not cool anymore. Spyrogyra - Morning Dance -- my first taste of jazz fusion, which sent me (over later years) spiraling back in time to the likes of Ella Fitzgerald and Count Basie and Dave Brubeck and Billie Holliday and on and on and on. I know I'd have found the jazz greats eventually, but it was this and Catching the Sun that happened to be my firsts. We all know how important firsts are, don't we? Such is the power of these two CD's that popping them into the CD player while having a nice leisurely breakfast/brunch will absolutely MAKE my Sunday. But I do still like the music. I guess this turned into a romp through my music history rather than a "what are you listening to right now" quiz. Hmmmmm......just as well, since I suspect none of you really wants to listen to recordings of our shop-vac and drywall gun. I'll see if I can get Josie and Leon to sing to you. Much like Cassie I'm curious what other KAL-ers are listening to these days, but to keep it fresh I'll take it out to the Sari-a-long ladies. What do you say Gina, Lynn, and Risa? What's in YOUR ear?